Additional Info: Radiation necrosis often enters into the differential diagnosis of an expanding brain lesion following therapy. The diagnosis is established by the presence of necrosis, thickened blood vessels and an infiltrate of macrophages. 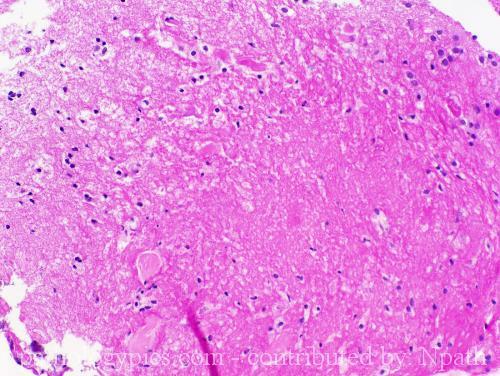 Cytologic atypia is unusual in the associated glia, although the endothelial cells may demonstrate atypia. Either smears or immunohistochemistry will reveal the macrophage population.